When your computer is put into standby mode, it's turned off ... mostly. And it might wake up again on its own. Is that an added risk? Not really. Standby is a power-saving mode used by laptops. Typically, if you fail to use your computer for some time, the computer will go into standby mode by turning off the screen, disk, other accessories and even the CPU, while leaving RAM powered so that it doesn't have to be re-loaded when you resume from standby. When the machine is truly in standby, it is for most practical purposes, off. The processor's not running, and the computer's typically not paying attention to the outside world; other than waiting for you to come back and push the power button, that is. If the processor's not running, then nothing's going to happen either good or bad. You won't get infected by anything. "... there's nothing particularly special about standby that would make it any more risky than just using your computer." But here's the catch: some laptops will "wake up" on their own. I've seen it happen where a laptop periodically wakes up for reasons unknown and goes back to sleep. It's unclear if this was a bug, or some kind of state checking feature. Of course while it's awake, the computer is once again "on". So that would be something to at least be aware of. So, presumably, there's a window where the computer is on again, even though you've placed it in standby. Now, all that is actually fairly insignificant, because as I said, that simply means that standby is really no more secure than when your computer is on. And your computer is secure when it's on, right? I mean, you've done all the right firewall, anti-spyware, anti-virus and other things to stay safe when you're using the computer, right? If so, there's nothing particularly special about standby that would make it any more risky just using your computer. In your case, it's extremely unlikely that anything happened while you were in standby, since most of the time, your computer is off when in standby. It's much more likely that whatever took place did so while the computer was on and running. Particularly given that most spyware infections happen because somebody did something while actually using the computer. Why can't my machine hibernate? And how's that different than Stand-by? Hibernate and standby are ways to save power when you're not using your computer. Each has pros and cons. Hibernation, at least, must be enabled. Why does my network not work after resuming from standby? Network failures after standby are not uncommon in older machines. Fortunately, fixing network problems after standby is not difficult - usually. 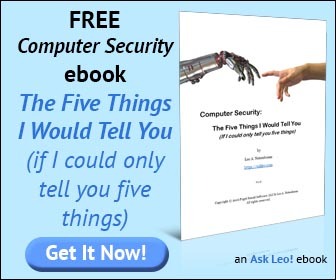 I think you want to say leo that in standby mode there is no really activity on your laptop and you are totally safe besides you turned on your firewall and your antivirus or anti spyware , the really danger if there is any hidden activity on your laptop. I stopped using Yahoo software a year ago, and noticed a HUGE drop in Spyware on my machine (I run checks every week with 3 different programs). It still surprises me why Yahoo is still so popular, when it is so very intrusive? My computer wakes up when I have put it on hibernate!! What could cause that? Under Device Manager the power settings of each item(though perhaps not every one) let you change whether the device should do this or not. I believe that hibernation is not enabled by default. If your laptop is on battery and in standby but approaches the low point, what happens when hibernation has not been enabled? With hibernation: The data which is written to the HDD, how do you delete/manage this? Can you, say, have Tuesdays's grind(a compilation of open work) saved and loaded on demand? Were this possible, would the files reflect updated content or time of save access? I am wondering about TRUE standards of energy efficiency. Many hardware stats cite "on Vista"... this concerns me since Vista is in troublesome status with my "rule of efficiency"(get work done the quickest and shut off completely when not working. When in between be able to respond quickly -- which goes back to getting work done quickly). Vista has so many crashes yet on default: Hard Disks, Monitor, et cetera go off after about 10 minutes and/or the system goes into standby/hibernates. If the system is OFF/peripherals are OFF, you are not utilizing them...thus NO work is accomplished..it is better to turn off the device(if possible) My point: What is the true efficiency of the hardware? Better yet, what to look for in comparing hardware? Oh, furthermore. If you already have spyware, you might be just as susceptible to its effects in standby mode as when the computer is "active." please tell me if there is software that will make my computer make a sound when it wakes up from stand by.